The ancient village is an exclusive 5-star location for ceremonies, conferences, business trips, and meetings. Villa is surrounded by a majestic 50.000 square meter natural park with a private church, breathtaking apartments, and a charming pool with rustic barns nearby that can accommodate gatherings of up to 200 people. Located in the town of Buti-Pisa, right in the middle of the most beautiful Tuscan cities such as Pisa, Lucca, Firenze, Siena and Livorno, this villa was established thanks to the careful restoration of an ancient hamlet dating back to the early 1700s, the original structures of which have been maintained in perfect harmony with the surrounding countryside. Here, you can experience first-hand the hamlet’s ancient spirit together with its peaceful and suggestive atmosphere.An entire hamlet all to yourself to celebrate your wedding, your anniversary, or simply to treat yourself with an exclusive trip with your friends or family. The entire village will be at your sole disposal, there will be no other guests, only your friends and family. Discover the magnificent dining room I Granai, the elegant apartments, the swimming pool and the wonderful park. Villa offers a breathtaking and exquisite setting, perfect for a romantic wedding set in a fairytale hamlet. With its beautiful colorful grounds and a myriad of plants and flowers, the picturesque pool, private church, the luxury suite for the wedding couple, stylish apartments available for guests, authentic barns refurbished to dine by the pool, it simply conjurs up the ideal setting to celebrate the wedding of your dreams. Besides the beauty and charm of the place, everything has been designed to the minute detail to make sure your special day goes as planned. The structure is completely fenced, protected by an electric gate, so you are secluded and feel protected, two adequately ample car parks able to accommodate up to 200 cars. Two kitchens have been furnished for catering, but are cleverly hidden and have a separate entrance from the guests. Each apartment has been enhanced with all modern conveniences so our guests have a really enjoyable stay here. Renovation work has focused on revealing the simplicity and warmth of country life, but uplifted with sophisticated features, in the choice of fabrics and colours, as well as attention to detail. The perfect combination of Tuscan rural tranquillity and luxury resort.The apartments sleep up to 26 people with both beds and sofa beds. The apartments take their name from the original buildings and professions that once occupied the hamlet. APPARTAMENTO ‘ IL GARZONE’ In the Tuscan countryside the “Garzone” or stable hand was recruited to help with agricultural chores, and began his apprenticeship at a very young age. The “Garzone” apartment accommodates up to 6 people and consists of two double bedrooms, two bathrooms, living room with sofa bed and kitchen. APPARTAMENTO ‘ DAL FATTORE’ In a rural community, the “Fattore” or farmer was the most important person, the one who organized and managed the activities, and who was respected by all workers. The “Fattore” apartment accommodates up to 4 people and has a living room, bathroom, study with sofa bed, bedroom, kitchen. Guests can enjoy a magnificent view of the attractive pool from the apartment. APPARTAMENTO ‘ IL MULINO’: appartamento su più livelli, 4 peThe mill is set apart from the other apartments. Decorated in stunning encaustic red, this apartment is divided on different floors including the a double room in the attic.The mill sleeps 4 with a kitchen, bathroom, studio with double sofa-bed and a double room. APPARTAMENTO ‘ DALMUGNAIO’ One of the most important occupations of the inhabitants of the ancient hamlet was milling. The Miller’s apartment can host up to 6 people; it’s made up of a kitchen, a sitting room with two single beds, two double rooms, and a bathroom. Usually the Miller’s apartment is the bride and bridegroom’s apartment, as it is the central one, closest to the heart of the party. The double room has a romantic four poster bed and a picturesque balcony, perfect for wedding photos. APPARTAMENTO ‘ LA TINAIA’: The Tinaia was the old cellar where the must, or young wine was left to ferment. The Tinaia has been converted into an apartment for 6 with kitchen, bathroom, living room with a double sofa-bed and two double rooms. 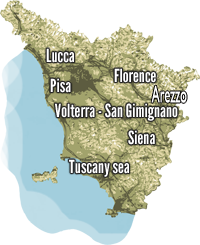 The ancient village, dating back to the early ’700, nestled in the Greens is in the middle of the Pisan hills between the villages most beautiful in Tuscany. From now on you you will be immersed in nature and in total relaxation through the huge park, the forest, the two lakes and the beautiful pool. The village will be at your arrangements which completely exclusive, just for you.